Jigged the Seamount this week, no doggies just a few odds & sodds like Almaco Jacks, groupers...A lot of small yellowfin and skipjack tuna in the area. Marlinbite has been quiet this week. 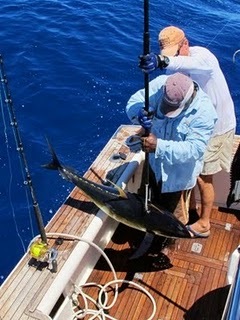 We had a sinking skipbait whacked by abillfish whilst we fought a yellowfin but it didn't return to finish offthe bait. Raised another small blue that lit up like a Christmas tree,methodically inspected three lures and then disappeared...probablybecause of all the tuna around us at the time.